Extended Hours For the Last Two Weeks of the Fall Semester to Begin Soon! Extended hours are nearly upon us once more! Extended hours begin on November 27, when Green Library will open on Sunday at 10:00am and close on Friday, December 3 at midnight. This schedule will repeat the following week, Sunday, December 5 to Friday, December 9. Hubert Library’s extended hours during that period will be Sundays through Thursdays, when they will remain open until 3:00am, and midnight on Fridays. For a detailed breakdown of the schedule, visit go.fiu.edu/libraryhours. Read more about Extended Hours For the Last Two Weeks of the Fall Semester to Begin Soon! FIU Libraries' Guide to all things "Mysteries and the Unexplained"
It's Halloween, so it's also a perfect time to brush up on all things unexplained and mysterious, with our Mysteries and the Unexplained LibGuide! 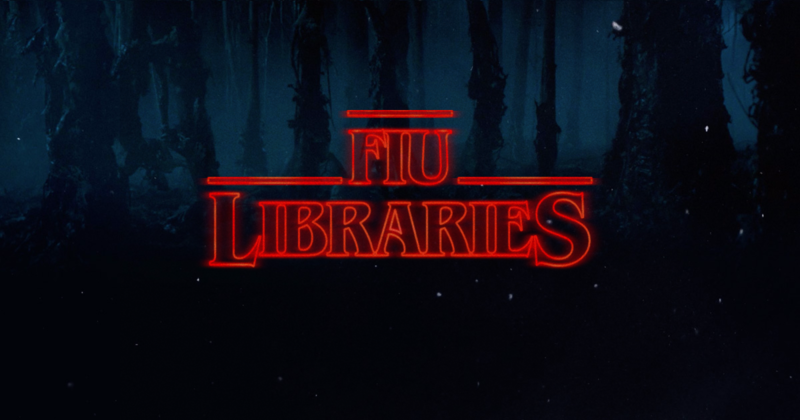 Read more about FIU Libraries' Guide to all things "Mysteries and the Unexplained"
April Lafferty joined the FIU Libraries team early this summer, working as a librarian at the Hubert Library at the Biscayne Bay Campus. Not one to let grass grow under her feet, she's already partnered with the Career and Talent Development (CTD) Department at BBC in order to raise awareness about library resources. Join us this Friday, October 14th at 6pm in GL220 for a reception with Renda Writer, a Miami-based "handwritten" artist whose work is currently up in the Green Library! Learn about the Affordability Counts initiative and how to apply. Banned Books Week 2016 began yesterday, September 25th! Help celebrate freedom of expression, open access to information, and your right to read. There will be a drop-in Banned Books Read-Out at the Hubert Library on Wednesday, September 28th from 10 to 2pm. Displays are up at both the Green and Hubert Libraries, so make sure to stop by! Clyde Butcher’s powerful black and white photographs explore his personal bond with the environment. The exquisite beauty and depth of his work draw the viewer into a relationship with nature. For more than fifty years, he has been preserving on film the untouched areas of the landscape. For four months, "Cuba: The Natural Beauty," an exhibition of his work, done in conjunction with the United Nations Conference for the Sustainable Habitat of the Mountains, will be on display at the Glenn Hubert Library (HL) at BBC. Join Us for the Opening Reception of Clyde Butcher's Photography Exhibition! The Hubert Library on FIU's Biscayne Bay Campus will host a photography exhibit by renowned photographer Clyde Butcher. "Cuba: The Natural Beauty," was done in conjunction with the United Nations Conference for the Sustainable Habitat of the Mountains and explores the mountains and coastlines of the island. Butcher's images are captured with large format cameras that use 8”x 10,” 11”x 14,” and 12”x 20” negatives, with exposures that are sometimes as long as an hour. The handmade, darkroom developed photographic prints range in sizes from 8x10 inches to 5x8 feet. Read more about Join Us for the Opening Reception of Clyde Butcher's Photography Exhibition! Don't Miss the First Ever BBC Library Fair! Do you want to discover new books and films? Make bookmarks and other fun projects? Play games? Eat candy? Then don't miss the first ever BBC Library Fair! Drop by the Hubert Library (room 175) on Thursday, October 13th from 11 to 1pm to meet your librarians, learn about available resources, and just have fun :) It's free and open to all! Read more about Don't Miss the First Ever BBC Library Fair!